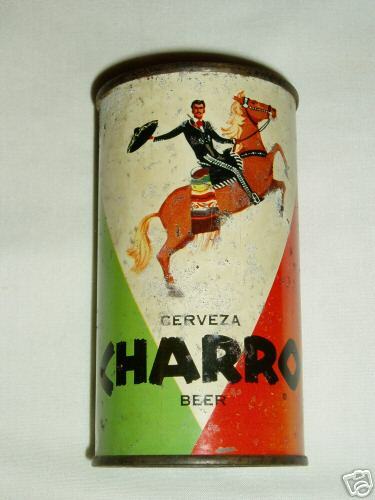 ← Houston Ice & Brewing Co.
Update: The above are photos of a can of Charro Beer, which appears also to have been a Gulf Brewing product. This appears to clear up some confusion over Grand Prize which I knew had survived the Magnolia Brewery. In the 50s as I recall, Grand Prize sponsored the Baseball Game of the Week on TV (national); one of the announcers was former Houston Buff pitcher Dizzy Dean. 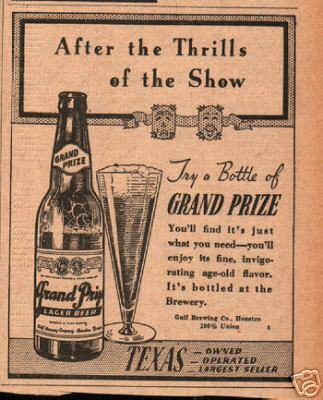 I have a vague memory of commercials in the 50s for Grand Prize saying ‘breweries in Galveston and El Paso.’ Maybe I have that mixed up with some other beer. Yeah, there is some confusion out there about who made Grand Prize, when, but the post-Prohibition link to Gulf Brewing is very strong. I suppose it’s possible that Brogniez had enough ownership of the name that he was able to take it with him from one brewery to another, assuming there he did brew it at Magnolia previously. I’ve definitely seen references to Dizzy Dean playing for the Buffs before playing for St. Louis, which is pretty cool for Houston. I think your memory is likely right about Grand Prize in El Paso. In my post on Brogniez, I mentioned that he moved to El Paso during Prohibition (which a TABC public information officer recently told me didn’t end in Texas until 1935), to work with brewing interests in Juarez – so maybe there’s a connection based on that alone. 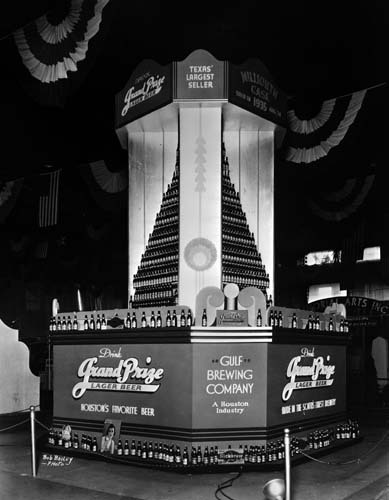 But I’ve also read that Grand Prize entered the El Paso market in the 1930’s, and by 1936 was taking away considerable business from the Harry Mitchell Brewing Company, which produced Mitchell’s Special Lager, and which had previously dominated the market. 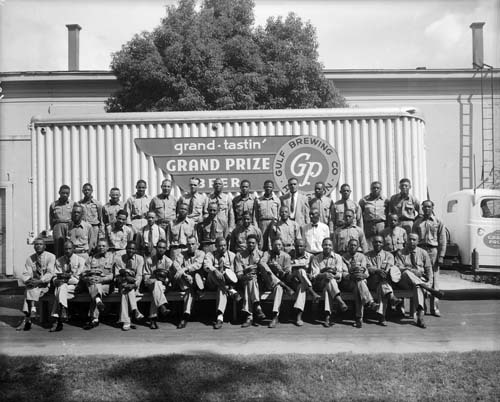 And it appears that there was at least a “Grand Prize Distributing Company” in El Paso from 1939 to 1943, based on other info I’ve seen. Put it all together with your recollection, and it sounds like El Paso was indeed a land-locked outpost for Grand Prize Beer, at least for a while. 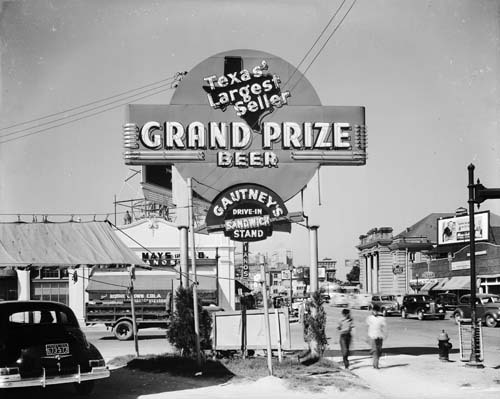 Your reference to Galveston reminds me that, while I didn’t mention it above, I believe that Galveston, over time, became an important production site for Grand Prize Beer, too. By the way, the U.T. Center for American History site has a whole bunch of Grand-Prize-in-Houston-related photos – far more than I could post here. Definitely worth a look. I read some of the posts and I think it is a great site. I like to flaunt my frequent action I have a good fresh joke for you! Why do birds fly south for the winter? Because it’s too far to walk. Gatemouth Brown made a record about Grand Prize beer. It’s called “Pale Dry Boogie.” Grand Prize sponsored a lot of bands in Texas. Gulf Brewery only had a plant in Houston. Falstaff, which bought Southern Select in Galveston in 1955, also had a plant in El Paso. I think that’s where the confusion is coming in. There are more than six good condition Charros and Buccaneers in existence. They can be had for less than $2000 each. Grand Prize was never made in Galveston. Ken – I looked quickly and couldn’t find any reason why I thought there might have been a Galveston brewery. Maybe I was confusing manufacturing and distributing. Thanks for the comments. Ken’s site includes an interesting chronology of Houston breweries. I have an old “Pale Dry Pete” statuette that I discovered in an abandoned house some years ago. I remember GP 20 – Grand Prize Beer celebrating its 20th anniversary? My older brother drank it. I would like to find out the value of Pale Dry Pete. Does anyone have an idea? My father worked at Hughes Tool and on Fridays would come home with a free case of Grand Prize ‘shorts’. These were bottles that were not filled to the proper level and could not be sold, so Howard gave it to employees. My dad passed away last spring and I have a collection of glasses, some coasters and a zippo lighter. I am intersested in the clock and statue listed above and would like to ‘hear’ from you if you still have them. Sam, was your father Dean Weeke? I worked at Hughes Tool in the late 70’s and knew a person by that name then. Would be interested to know if they are one and the same. I still have Pale Dry Pete. Still have no idea what the value might be. If you email me a pic, I can tell its worth. Thanx. Can I please get your email address so that I can forward a picture to you? Hello Ken. I found this old sign yesterday. Can you possibly tell me it’s value? Sorry, it would not allow me to post a pic of my “ Drink Grand Prize Beer” sign. I will send it when you respond to my email. Thanks! I also have a zippo lighter bearing the Hughes Tool logo with a signature on it. Can anyone tell me anything about it? Any history or estimated worth would be appreciated. My parents were GP drinkers. My father did not work for Hughes, but on his way home (Seabrook) from work, he would stop by the brewery and pick up a case or 2. I have an old can/bottle opener with the Grand Prize logo. I also have pump keg tap that probably came from a Grand Prize keg many years ago. Both are cherished items, even if the keg pump isn’t authentic! I have a Grand-Tastin’ Grand Prize Beer Coaster. It has a photo of a building and the caption below is “Third Capitol of the Republic of Texas located in Austin 1839-42 and 1845-46” Gulf Brewing Company, Houston, Texas. It’s in perfect condition. Do you know what it may be worth and/or if anyone may be interested in it. I recently purchased a framed promo photo of a baseball team wearing Grand Prize uniforms. The ball team photo has some minor damage but has the full team pictured with the manager. It looks like the photo may have been a promo handout for advertising purposes. I am guessing it is late 40’s early 50’s vintage. One man signed it over his likeness. I also have the full set of Grand Prize coasters with the 5 capitals of Texas on them. They are in good to very good condition with clear writing. They are fragile due to their age. I have no idea what they are worth, but I would imagine about $10 each. As a set they might be worth a little more. 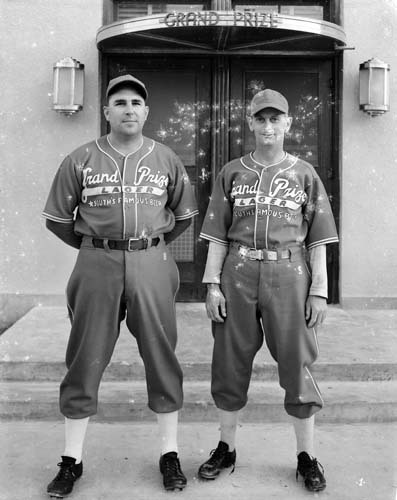 My grandfather, Virgil Dixon, played minor league ball for the Grand Prize team during this time. Does your photo happen to have a roster of names? I own the Gulf Brewing Company truck, it is a ’48 Dodge. I have all of the original paperwork, registrations andcertified documentation of it authenticity. Do you still have the truck? I would be interested. Price? Do you have pictures of the truck? I would love to see it! Mr. Brogniez if you will send me your e-mail address I will send you a copy of my article about F.B. and H.H. Please email me pix of your stuff. If I can’t find a buyer, I can print the pix in my online newsletter. The newsletter is about beer can and breweriana collecting, as well as industry news, and humorous stories about beer. I have a old Grand Prize Beer Clock …sit on shelf style. Has a thin florescent ligh built into the base that travels through the plastic clear clock face and illuminated the letters: Grand Prize Beer/red & white…. 75-80 years old….working condiion any idea of the value? thanks! Could you post a pic or two of your clock? Have Grand Prize milkglass ash tray excellent con On back made in USA with the number 17 on it. It has to be 40yrs old or older. Need to know the value? Without seeing a pic, your ashtray is from the late 50s/early 60s (older than you thought), and is worth between $10-$15. ABOUT 50 YEARS AGO IN A WEINGARTEN’S SUPER MARKET IN BAYTOWN, TEXAS, THERE USED TO BE A STACK OF BEERS ON DISPLAY AT THE FRONT PART OF THE STORE WHO’S BRAND WAS –KOL– ON THE CAN IT SAID GULF BREWING COMPANY. WHAT WAS THIS TYPE OF BEER? ALSO, WHY HAVE NO MICRO BREWERYS ATTEMPTED TO RECREATE THE GRAND PRISE AND MAGNOLIA BRANDS? Kol was a store brand brewed by many different brewers across the country, including Gulf. If you had one of those Kol cans today, it would be valuable. Do you still have the picture??? Stay tune for more info on “NEW” Grand Prize Beer !!! Interesting stuff… I decided to google this after finding a pair of ‘Grand Prize Lager Beer’ bottle openers. Up until then, I’d never heard of it or had any clue in regards to it’s relation to houston or texas. Could you email a pic of your father’s union card? Also, any other pix of Grand Prize stuff you may have. I’ll include them in my newsletter i write about old beer collectibles. Thanx. Hello everyone. I stumbled upon this website after researching an item I dug up at a Houston park over the weekend. It appears to be a Grand Prize Pale Dry Beer medallion dated 1952. I am looking for any information about it? I recently found an old Gulf Brewing Co. Grand Prize Lager beer can in an old building. 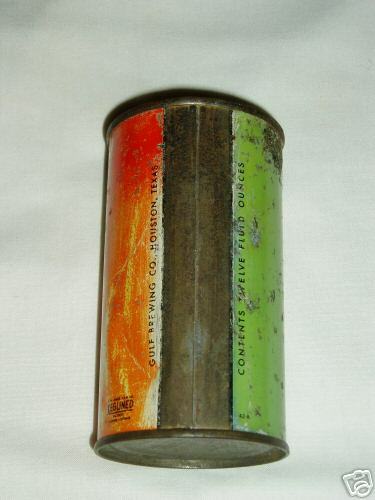 The can is in good condition and has instructions on the side on how to open it. Would like to know more about it and if it has any value. The link below should show a picture of can. Appreciate any info. I might considered selling it in time but I do not know its value. I have not seen the reply that I posted last week about when I visited the Gulf Brewing Co. with my parents in 1934 and we had lunch with Howard Hughes and the Brewmaster Mr Franz Brongiez. My father had been invited to the Brewery to receive an award for selling the most Grand Prize Beer in the State. I have written an article about this meeting in depth – this was the only visit HH made to the Brewery I was told. Mr. Brongiez gave my mother a nice glass engraved beer mug that I still have, and he sent me a Schwien bicycle. I have a set of 6-4oz. GrandPrize beer glasses that my Mother had in her bar in the 1950’s. Could you possibly send pix to: kenk2260@earthlink.net ??? i noticed a grand prize beer tray on ebay looks cool! i think i just might get it. My father was an accountant with Grand Prize for about 25 years. I remember some of the names of other employees & also have pictures of them with “The Cisco Kid and Pancho.” GP was the sponsor for that TV series starring Duncan Reynaldo & Leo Carrillo. If anyone is interested in a copy of the picture, send me an email at the address below. Hi Diane, I’m always looking for information about GP, especially the early years. I’d love to see the pic of Pancho and Cisco. My email is psb@airmail.net. “Grand Prize, Grand Prize, is the beer to buy. the sparkling brew is mellow too, and you know we wouldn’t lie. This was sung to the melody of a classical ditty but I can’t remember the name at the moment. What was the address of the Gulf Brewing Company please? have found a blue plastic recipe box with grand prize beer logo on lid, has about 70 recipes all using grand prize beer in them. The box has faded over time and appears to be dirty even though I have lightly cleaned it. Any idea of it’s value? Its worth from $30-50, depending on condition. Hello all. My mom passed away last June. I have taken my time going through the many treasures I have found. I came across a very old church key. On one side it says Grand Prize Beer; on the other side, Top Of The Brew. I am googling trying to find out how old this key is. I stumbled across this site. Anyone know the year that Grand Prize Brew was first sold and the last year? Thanks to all. Hello, I have an original large Grand Prize Beer Ice Box / Cooler up for auction on ebay right now. Thanks everyone. 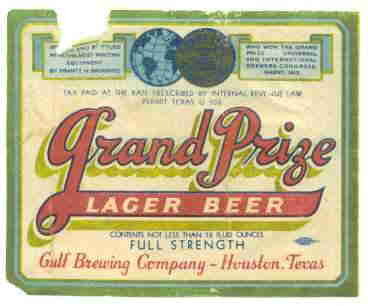 Any idea what the value of a 4′-0 x 6′-0″ Grand Prize Beer sign is worth? It’s got an orange background, a doubletriped border (brown outer border, red inner border), “Drink Grand Prize Beer” is done in wite letters with black shadowing. It has graphics on either side of the word “Beer” that are wing-like. It is painted on very good quality brown masonite (not uncommon for old advertising pieces). The sign painter is W.G. Raiford. The sign is about a 8.5/9.0 out of 10.0. I worked at Hughes Tool in the mid 60s and as far as I can remember there was no fire involved in Hamm’s pulling out of the old Gulf Brewery. As I understood it, Howard Hughes needed the space and refused to renew Hamm’s lease. I do know that after Hamms pulled out the brewery was being demolished and a welder accidentally set it on fire and it burned to the ground. Hughes then built a Hughes Aircraft Helicopter Transmission manufacturing facility in it’s place. In 1968 while refurbishing a top floor office in the old brewery administration building we found a walled up closet. In the closet were 3 cases of unopened Grand Prize Beer. Wish we had kept a few of them now! Interesting information. Do you know why Hughes shut down Gulf Brewing? Just went to a wedding in the Magnolia ballroom in downtown Houston…. lots of grand prize and houston ice and brewing items…. lots of pictures as well. I have a Grand Prize recipe box with some recipe cards inside. Would like to sell but no idea as to the value. Any help appreciated. Thank you! Value of 6 thick glass Grand Prize Goblet glasses. Was given to me by Bob ragsdale,the owner of the 1220 club, in the late 40s,can not remember the street it was on, but that was the address. 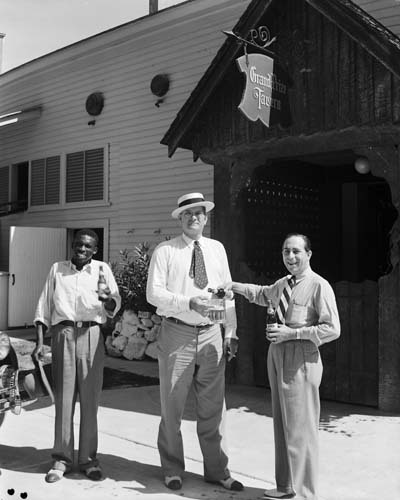 Floyd Tillman played there in the 40s and 50s before he became popular.it was a fancy ice house. Anyone one remember the street it was on. The glasses have the Grand Prize writing in red. Floyd sang commercials for GP beer.We bought a case of GP for our school graduation and it cost 2.99 with returnable bottles in 53. My Dad was a welder at Hughes.